Inspired by a tweet from Gordon this is a quick post to highlight some good customer service…well I thought it was good. Before I crack on, here’s the tweet – makes me chuckle every time I see it. Towards the tail end of last year I needed my badminton racket restrung. I decided to try PWP which had opened a branch in Glasgow and was impressed with string options, friendly service and quick turn around. However on it’s first usage the strings broke and the racket developed a crack at the top of the frame. I couldn’t be sure that a crack wasn’t there before and had been worsened by having it restrung or that PWP were to blame. On returning to the store we had a very honest talk about the problem (which was refreshing – no pointing of fingers and trying to get rid of me). Even though I hadn’t bought the racket from them, PWP agreed to send it to Yonex and ask then to investigate for flaws or what was to blame. 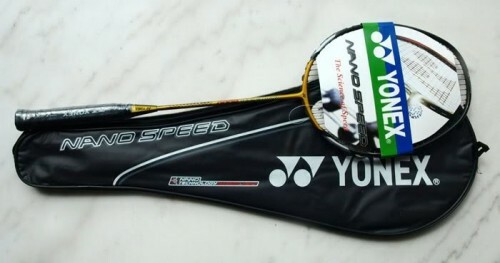 Roll forward a couple of months and the feedback from Yonex was that I caused the damage. Bugger. I didn’t really expect the result to be anything else so it was time for a new racket…and a return trip to PWP despite the restring question marks as I really felt they dealt with me honestly. I sized up the rackets on the shelf and was quite taken with a couple of Yonex models, both priced at £139. I probably should have checked for prices online but I wanted instant gratification. Imagine my surprise when the staff member I was dealing with told me that the 8000 model shown above was reduced to £89.99, they just hadn’t had time to update the labels on the racket. Instant sale. He didn’t have to tell me that as I was already thinking of buying at the higher price. Can you imagine a car dealer or your typical Comet/PC World guy telling you it’s cheaper than the ticket price online. Usually you have to ask, badger and complain until the price comes down. So not only was I impressed with PWP’s honesty but at all times the staff have been friendly and knowledgable. So if your looking for anything badminton, squash or tennis related in Glasgow I heartily recommend PWP whose shop is in Partick on Dumbarton Road (replacing the suncenter that was there before – like Partick needs more tanning salons). There’s even a 14 day return so if the racket doesn’t suit my style of play I can return it. Fantastic.